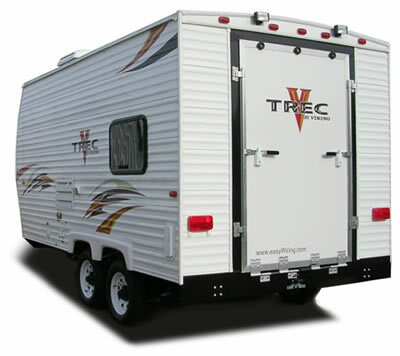 CENTREVILLE, Mich. — Whether you are one of those rugged types who likes to go camping with friends and take your toys along, or you simply appreciate the versatility of an affordable multipurpose trailer, you will love the new V-Trec™ 16 from Viking Recreational Vehicles. This is Viking's first hard-sided toy hauler, built in the Viking tradition of creating rugged, practical RVs that give owners a lot for their money. "There are a lot of people out there with ATVs and other outdoor toys who would love to have a toy hauler to help them get away from everything but still have a comfortable living space. 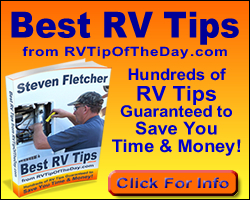 However, they don't want to spend what it typically takes to get most of the toy haulers available today," said Jeffrey Koch, national sales manager for Viking RV. "V-Trec is the perfect, small, easy-to-tow, very versatile trailer that's just what they need." Weighing in at under 3,500 pounds, most SUVs and half-ton pickups can easily tow this multi-functional trailer. It goes to work as a trailer to take to the jobsite, hauling materials and equipment; and then on the weekend, load it up with motorcycles or an ATV and head out for some off-road fun. In addition it comes with a very affordable price tag (MSRP) starting at $13,890. The exterior aluminum skin is durable and functional. Viking added eye-catching graphics and an optional checkered flag awning to make this trailer stand out. The rear ramp door can handle up to 2,000 pounds of weight and utilizes coil spring hinges so there are no cables to get in the way while loading equipment. A spray away outside shower with 15-foot coiled hose is also available as an option for washing sporting equipment after use. Once inside, it's obvious that V-Trec is more than a cargo trailer. For its size, V-Trec is surprisingly spacious with an interior height of 6 feet 9 inches and multiple windows let in plenty of natural light. The trailer comes complete with a shower, marine toilet, six-gallon gas water heater, cooktop, microwave oven, double bowl sink, refrigerator and 16,000 BTU furnace. Viking paid attention to the details when designing V-Trec. For example, the sidewalls are reinforced to allow for hanging a variety of tools or gear; and the floor is insulated for climate control. The V-Trec 16 comfortably sleeps two on its 76-inch fold up bed/sofa. With the optional second fold up bed/sofa and the manual pull-down queen bed, the V-Trec 16 can sleep up to six. Viking plans to introduce additional, larger floor plans of V-Trec later this year. The Viking V-Trec is a multi-use hauler. It can work hard during the week and play even harder on the weekends. And, it's one of the most affordable toy haulers available today.